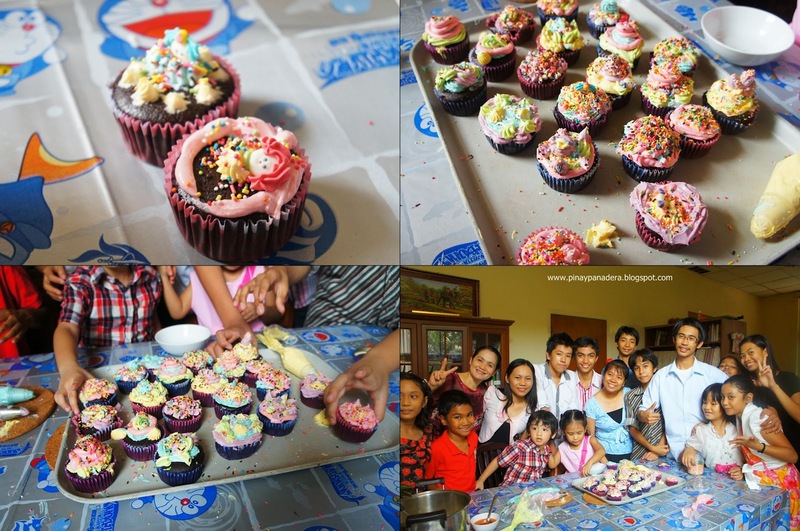 Since Christmas time the kids in church had been bugging us about decorating/designing cupcakes. The plan had been postponed many times because we just couldn't find a suitable occasion after the holiday season. When the head of the Children's Department in my church learned about my sister's birthday she quickly planned a potluck for the kids. My sister requested everyone to come because this time the plan would push through. The children got all excited. She ordered cupcakes and vanilla butter cream from me. The cupcake recipe is based on Joy of Baking.com. 2. In another bowl, sift together flour, baking powder and salt. Set aside. 3. In a bowl of your electric mixer, or with a hand mixer, beat the butter and sugar until light and fluffy. Add the eggs one at a time and beat until well incorporated. Scrape down the sides of the bowl when needed. Beat in the vanilla extract. 4. Add the flour mixture in 3 separate additions and beat until incorporated. Then add the cocoa mixture. Stir until smooth. 5. Fill muffin cups lined with paper liners about 2/3 full and bake in a preheated oven at 190 degrees C for about 16- 20 minutes or until the toothpick inserted in the center comes out clean. Note: This recipe yields 22 normal size cupcakes. 1.In a large bowl, beat together the icing sugar, butter and shortening until light and fluffy. 2. Add the whipping cream. Beat. Lastly add the vanilla extract.Beat until well incorporated. 3. Use any food color of your choice. I used blue, pink,yellow, green and purple food colors. 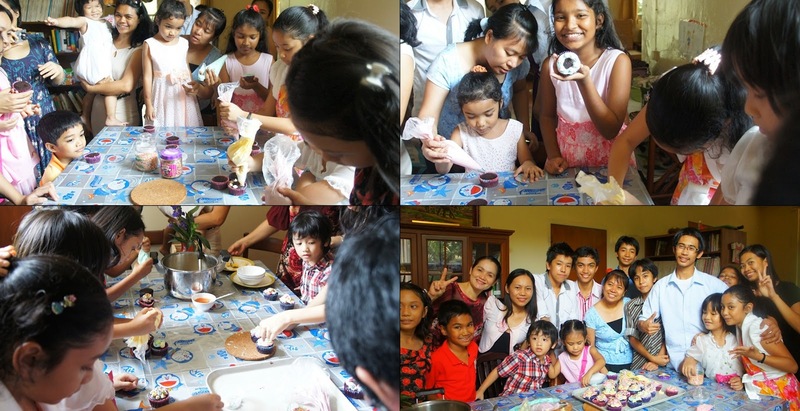 The kids were so engrossed in making their own masterpiece. After I took photos, they were quick to take the ones they decorated and munched them . 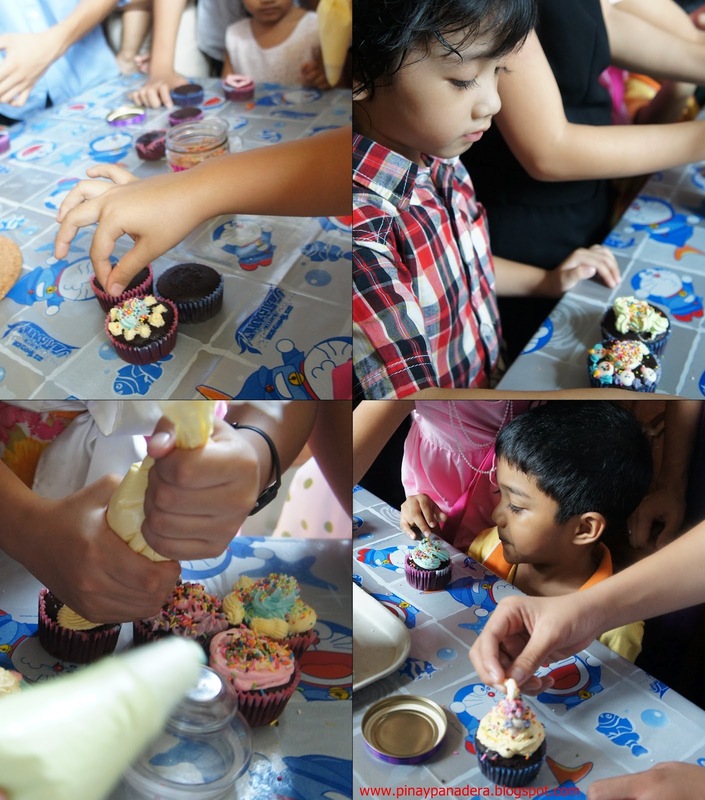 Cupcakes surely are excellent party food!!!!!! It was indeed a great gathering.